Playstyle: Well-rounded character with emphasis on his pokes and pressure. -Basic attacks reach rather far, giving Thonolan a lot of decent pokes. -Pretty good anti-air game thanks to his basic attacks and Rising Flip. -Good damage output and has quite a few combos. 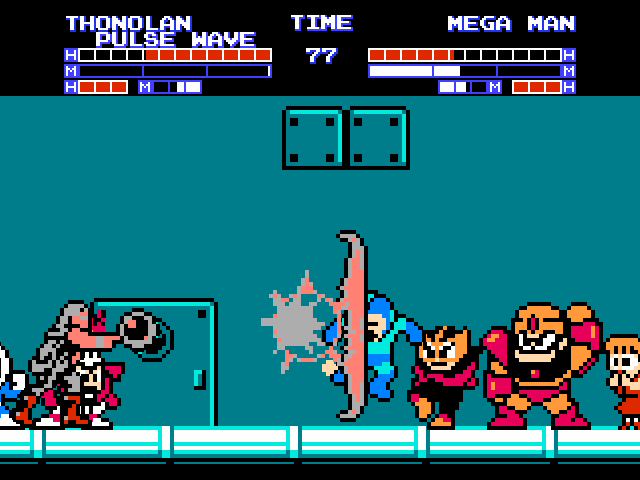 -Solid pressure game due to his pokes, Bouncing Bulb and Soaring Kick. -Most of his basic attacks have a bit more start-up and/or recovery compared to others, requiring Thonolan to use them at max range. -Bouncing Bulb is lacking compared to other projectile attacks; it's not great for projectile wars and it's notably slow. -Grab range is rather small and his below-average walk speed doesn't help with throwing the opponent. Front Double Kick (Forward + Punch, Punch) - 2-hit combo that knocks the opponent down. Both parts can act as an anti-air and the second kick can hop over low attacks while being immune to throws. Butterfly Kick (Down-Back + Punch) - Hops over low attacks and is immune to throws. If this move successfully hits, it's possible to link afterwards with basic attacks. Knee Drop (Down + Kick; Air only) - Range is rather short but it also makes Thonolan drop down faster. Bouncing Bulb (D, DF, F, Punch or Kick) - Thonolan summons an orb that tosses out a bouncing bulb. Punch version throws it farther from Thonolan while the Kick version throws it closer; causing it to bounce up much sooner. The start-up on the projectile is rather slow and unlike other projectiles in the game, the speed of it can't be altered. This makes it not suitable for keeping opponents out or dealing with projectile wars. However, the angle can be altered to serve either as a long-range option or an anti-air for Thonolan. Soaring Kick (Hold B, F, Punch or Kick (can be done in the air)) - Thonolan does a sliding kick (or a flying kick in the air; acts a bit similarly to the original flying kick). The Kick version goes farther and does more damage. On the ground, the move is rather unsafe unless done at max range. 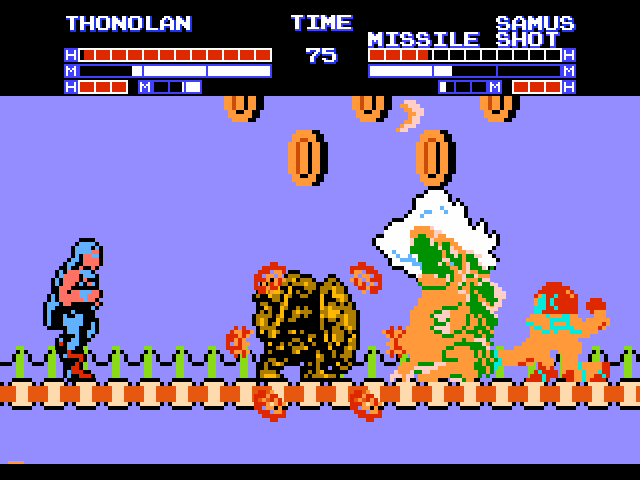 The shortened hitbox does allow Thonolan to go under high attacks and certain projectiles. In the air, Thonolan flies forward while moving slightly downwards. On block, Thonolan rebounds off of the opponent and is unsafe regardless of range. Rising Flip (Hold D, U, Punch or Kick) - Thonolan's special anti-air and reversal. 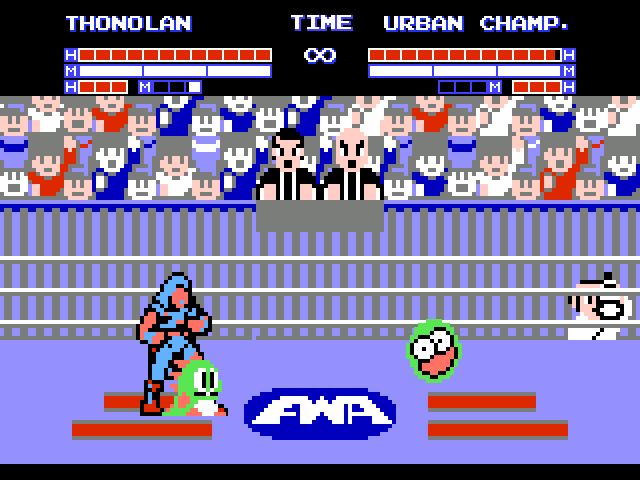 Punch version travels the least distance and has him only do one flip but has invincibility in the beginning. 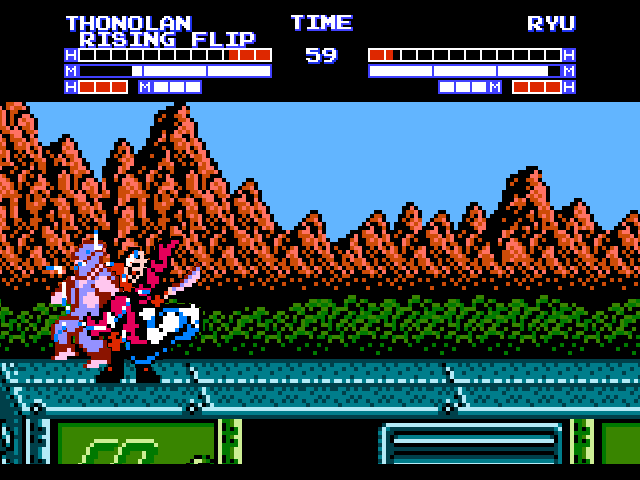 The kick version drops the invincibility but has Thonolan flip 3 times, making him travel farther and do more damage. This does more damage compared to Soaring Kick but doesn't travel as far and both versions leave Thonolan unsafe on block. The attack also doesn't remain active for long, requiring you to time it in order to properly anti-air with it. EX Bouncing Bulb (D, DF, F, Punch and Kick) - Travels straight across and deals two hits. If it collides with the wall it's flying towards, it will bounce back and on contact, it can knock the opponent forwards. EX Soaring Kick (Hold B, F, Punch and Kick (can be done in the air)) - Ground version travels as long as the non-EX Kick version but on contact, Thonolan immediately goes into a Vertical Press Kick (his Crouching Strong Punch) which launches the opponent upwards. Air version travels straight across and has projectile invinciblity in the beginning. Blazing Flips (Level 1) (D, DF, F, D, DF, F, Kick) - Thonolan launches himself up-forwards while doing five flip kicks. Has some invincibility in the beginning but is horribly unsafe on whiff and block. Works well with juggles. 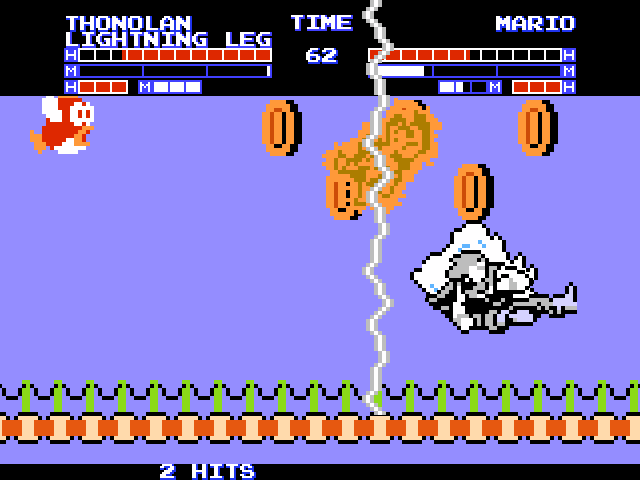 Lightning Leg (Level 1) (Hold B, F, B, F, Kick; Air Only) - Thonolan does a flying kick forwards and on hit, several lightning bolts strike down on the opponent. This move has some projectile invincibility in the beginning and is useful for air-to-airs. On block, Thonolan rebounds the same way as the Air Soaring Kick however. Pulse Wave (Level 1) (Hold B, F, B, F, Punch) - The orb gets summoned and it creates a pulse wave. The pulse wave can go through projectiles and enlarges the more it travels (although there is a max size). 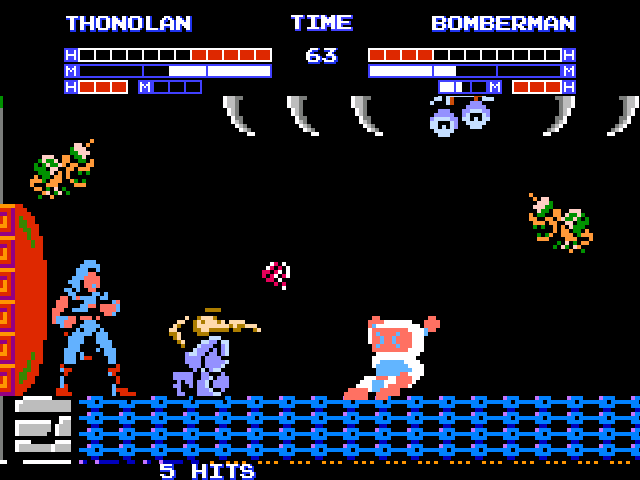 Sky High Kicks (Level 3) (D, DB, B, D, DB, B, Punch+Kick) - Thonolan does a Rising Flip Kick that travels forward and if any of them connect, it launches the opponent up into the air. 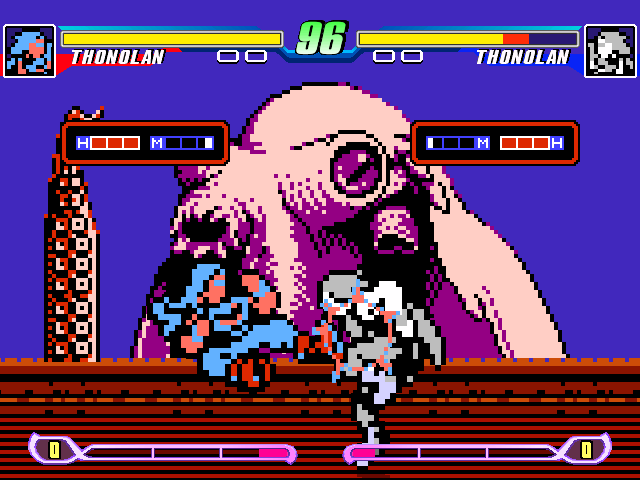 Thonolan proceeds to fly after them with spinning his legs, constantly hitting them and then finishing them off with stomping them into the ground. This move has invincibility during the entire first flip but on block, it's horribly unsafe. Rat Soldier will attempt to block any attack that gets thrown at him with his shield. His shield can defend against basic attacks and special projectiles. Anything stronger will bypass the shield and cause him to get hit. While blocking, the Rat Soldier himself is not immune to aerial attacks. He's unable to block if he's in the middle of an attack. Great Kicking Skills - This was probably obvious but in a similar way that Urban Champ. only uses his fists in his attacks, Thonolan only uses kicks. Fantastic work KingPepe2010! I'm loving it so far, keep it up! Been a bit quiet about Thonolan's development, sorry about that! Looks pretty cool! 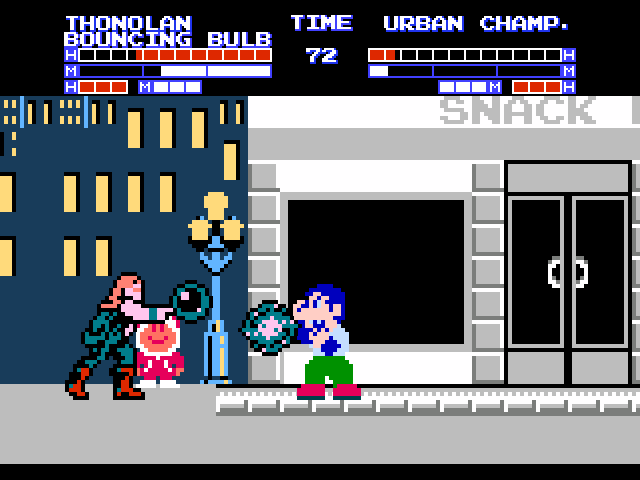 I can't wait to test him out seriously since Thonolan is one of my fave characters in the NES game library, keep up the good work! He can break those cuffs! Excellent work! Can't wait for this release dude. Aww maaan he looks dope!! Whens that trailer coming out?!? And Thonolan has been converted! 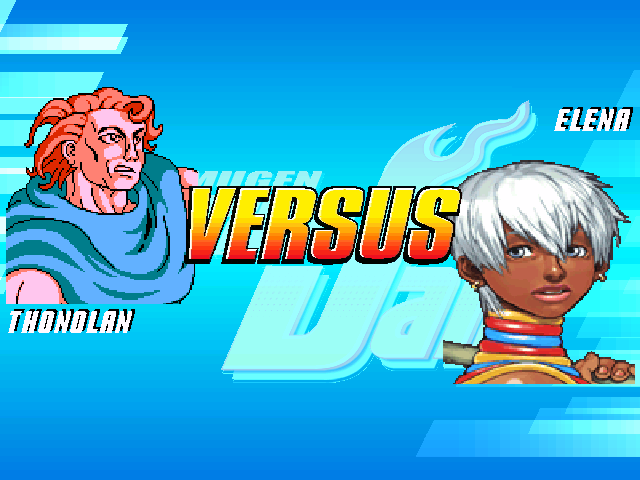 Music now only stops when Thonolan is performing his Round 2 winpose or if he dies.